Our Book Club will meet Monday, November 16th, 2015 at 6:00 pm. The exact location in Brighton will be provided to those who respond. All are welcome – You don’t have to be a member to attend. It may not be the same location as previous locations, so be sure to RSVP every time! 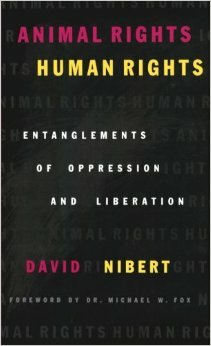 We will read the first four chapters (135 pages) of “Animal Rights / Human Rights” by David Nibert. This book is a little denser, so give yourself time to order the book and read. I expect we’ll discuss the second half (110 pages) in January – perhaps Martin Luther King Jr., Day, if that’s agreeable to others. Two good sources for used books are Alibris, and AbeBooks. Some include free shipping. Books can take a while to ship, so order soon to have time to read!